Are My Hardwood Floors Worth Restoring? Hardwood floors are a popular choice among homeowners. Not only do they add a timeless appeal to homes, but they are also long-lasting and easy to maintain. However, like everything else, your hardwood floor is bound to show signs of wear and tear with time – especially if you have children or pets. Once you have identified that your floors need reviving, the question that many grapple with is whether they need to be refinished, restored, or replaced. 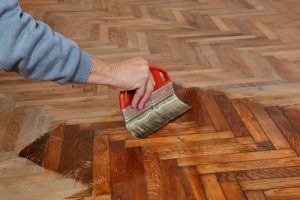 While refinishing is a quicker process that involves sanding, restaining, re-coating, and sealing the floor, restoring and replacing hardwood floors are a lot more intensive and time-consuming processes. The decision is a challenging one to make, but you’re not in it alone. Consult with hardwood flooring specialists who can guide you through the process and identify the best solution based on your home and budget. To get you started, here are seven cases when hardwood floor restoration might be recommended. While hardwood floors are extremely durable, scratches frequently arise if you have pets or children, and from regularly walking on the planks wearing heels. While minor, light scratches on the surface can be lived with or easily removed with a simple coating and buffing, it’s the deep scratches that need serious attention. No amount of polishing or coating will help in this case. What’s needed is advanced equipment that can get rid of scratches without stealing the luster and affecting the look of your sensitive hardwood flooring. Hardwood floors look best when they have their shine on. However, at some point, the wood will begin to show signs of fading. Whether it’s due to increased exposure to sunlight or just a build-up of dust and debris, the fact is that your floor has now started to look dull and patchy and needs a revamp. When you’re met with such a problem, there is no need to overhaul your entire flooring and get a fresh one installed. Hardwood floor restoration is often enough to tackle this issue and give back your floor its matte or gloss finish. As the popular saying goes, ‘prevention is better than cure’ and we cannot agree more. When your hardwood floor has been around for a long time and has begun showing signs of deterioration, it is advisable to get it restored immediately. Don’t procrastinate and wait for more damaged till you can’t live with it anymore. It is better to nip it in the bud because serious cases of hardwood floor damage will require you to get the entire floor replaced, which is a way more expensive and tedious endeavor. Picture this – you’re having a party and a guest spills red wine on your lovely hardwood floor or worse, drops a lit cigarette. Next thing you know, your floor is left with a pesky burn or stain, which ruins its entire look. The worst part about burns and stains are that they set in very quickly on wood. In order to get rid of it completely, you will need to restore that portion of the floor. Before you try to eliminate it yourself with a razor blade, paintbrush and pocketknife, give the specialists a call to do the job for you because any minor error can lead to bigger problems. Have you ever heard those insufferable squeaky sounds coming from your floor? If yes, don’t ignore it because your squeaky floor calls for attention. From poor wood quality and faulty installation to weather changes and even subfloor damage, there are several reasons that lead to loosening of floorboards and give rise to squeaky noises. Instead of indulging in temporary repairs, it is advisable to get the floor restored to bridge the gap and restore the root of the problem. Hardwood floor specialists know how to tackle this best because the treatment will differ according to the type of wood used. The biggest con of having hardwood floors is its reaction to the changing weather since it is a breathing material. However, don’t panic because this isn’t a drawback that cannot be dealt with. Cupping, crowning, and buckling are common types of warping your floors may face. Due to frequent absorption and loss of moisture, hardwood floors tend to shrink and expand causing this warp. The only way to prevent this from happening is by controlling the moisture in your home, but if your floor appears warped, you can get it restored. The best time to rectify this situation is during spring when moisture in the air is more stable. When you moved in, your new, shining floors had you gleaming with joy, but now that you’re thinking of putting your house up for sale, you realize how shabby and faded it now looks. When you are selling a house, you obviously want to maximize its potential and get the best returns. Don’t let your worn out hardwood floors repel potential buyers. Instead, make the most cost-effective update that will in the offer you’re looking to obtain. Add hardwood floor restoration to the list of repairs because floors are the first thing people notice when they enter, and you want them looking elegant and charming – just the way they were when you arrived. When met with these cases, people often resort to DIY techniques, but the truth is that very often, the problem is more than what meets the eye. Sit back and let us at Wall2Wall treat your precious hardwood floor with utmost care using our line of advanced, top-notch equipment. For us, there is nothing like seeing a smile on a customer’s face and we guarantee to leave you satisfied with our affordable services and expert-level craftsmanship. So, reach out today and let’s get back those ‘wow’ factor floors. This entry was posted in Uncategorized on September 5, 2018 by Oregon Hardwood Floors.